Last week we initiated the 2015 Global Research Fund Raiser. We thank our readers for their unbending support. In response to our campaign, I received an email from a concerned reader who expressed “doubt” because Global Research “had become increasingly ‘Anti-American'”. I emailed back and reassured him: Global Research is not “Anti-American”. Quite the opposite, we are “Pro-American”, in solidarity with the American people who are the victims of a corrupt government, which is lying to both the American public and the World. In turn, the corporate media is sustaining the foreign policy lies of the Obama administration, namely its alleged commitment to “peace-making” and “democracy” under the banner of a fake “war on terrorism”. Without the relentless support of the mainstream media, Obama’s wars would have no legitimacy, nor a leg to stand on. His foreign policy agenda would collapse like a deck of cards. 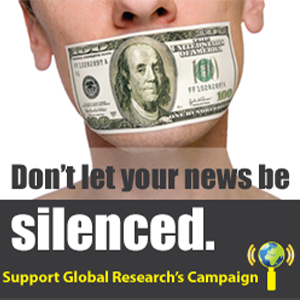 At Global Research, our News is Uncensored. Our objective is to break the lies and fabrications of the mainstream media. Our intent is “counter-propaganda”. Yes we are “Anti-US government”, “Anti-NATO”, “Anti-war”. We are “Pro-People of the World” in the true spirit of National Sovereignty, Multiculturalism and Internationalism. The US State apparatus manages a global war agenda, an imperial design; it also upholds a neoliberal economic policy framework which serves to impoverish people both at home and abroad. The World is at a dangerous crossroads in our history. Truth in media is a powerful instrument which serves to dismantle the “unspoken consensus” in favor of the Pentagon’s “Long War”. Our objective is the “criminalization of war” as a means to reaching the longer term goal of World peace. Your donations are vital to sustaining Global Research’s commitment to this essential focus.